Patients are doing the best they can and they want to improve. 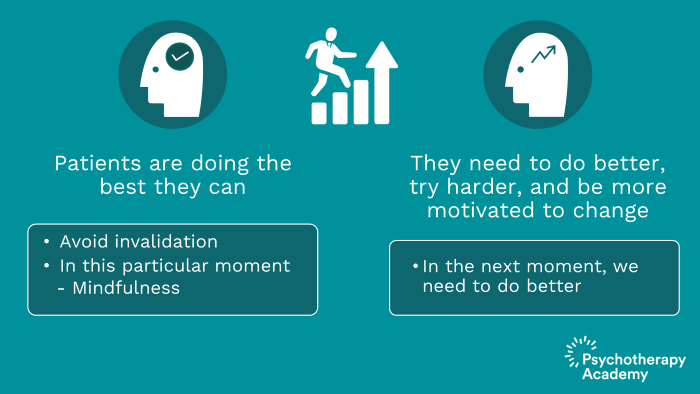 Patients need to do better, try harder, and be more motivated to change. The lives of suicidal borderline individuals are unbearable. Patients must learn new behaviors in all relevant contexts, and cannot fail in therapy. 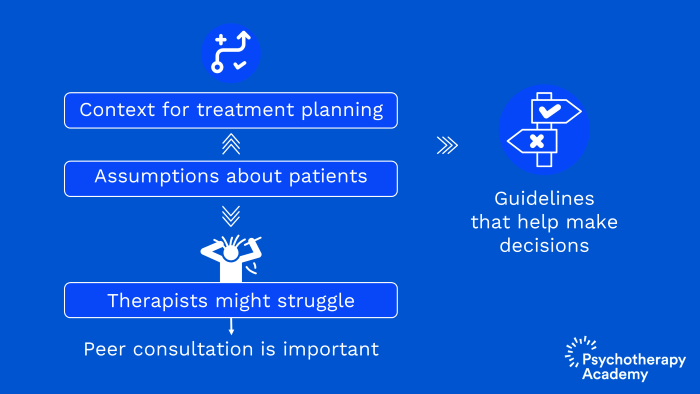 DBT therapists go into therapy with assumptions about patients This helps to form a context for treatment planning and generally helps make treatment go more smoothly. Assumptions, of course, are not proven. They’re just guidelines and sort of a foundation that will allow us to make decisions and dictate to some degree the choices that we make in any given moment. So some of the assumptions about patients are more difficult to wrap one’s brain around than others. And typically, therapists will find that they struggle with one or two of these assumptions. So it may be helpful to bring each of these assumptions up in team from time to time and ask colleagues in your peer consultation team which ones they struggle with from week to week. So the first assumption is patients are doing the best they can. When we are thinking about an assumption, we have to take for granted that no matter how we feel the facts are as they are. So this particular assumption, patients are doing the best they can, is an essential one in order to avoid invalidating the patient by suggesting that they are not trying. So doing the best that they can does not mean that they cannot do better in the next moment. So mindfulness is a part of DBT and Zen principles are a part of DBT. And part of the implication with this assumption is that from moment to moment we are all doing the best we can, the best we can given what we had for breakfast, the best we can dependent upon our childhood histories, the best we can dependent upon the individual we’re interacting with or whether it’s raining, etc. So doing the best they can is in this moment. This is juxtaposed against one of the other assumptions that patients need to do better, try harder and be more motivated to change. One can see the dialectic in patients are doing the best they can and they need to do better, try harder and be more motivated to change. They seem almost contradictory but in fact they go together because in this moment we’re doing the best that we can and in the next moment we need to do better. So another assumption is that patients want to improve. Again, in order to avoid invalidation, severe invalidation of the patient, we want to go in with the idea that people want to feel good. Everyone wants to feel good. And so that leads to the conclusion that since patients are miserable, in fact, one of the assumptions is the lives of suicidal borderline individuals are unbearable as they’re currently being lived, so if that is true that the lives of suicidal borderline individuals are unbearable then it naturally leads to the idea that they would want to improve, that they would want to feel better. The nature of things being unbearable is that we would want them to be bearable. 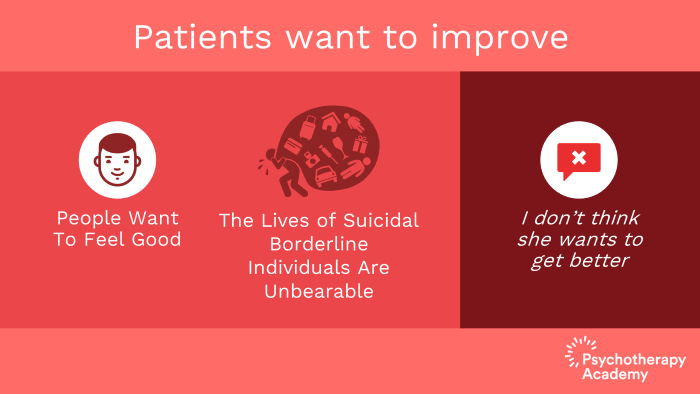 So patients want to improve. We would never say in DBT “I don’t think she wants to get better.” That doesn’t mean that we cannot look at the contingencies which might make it more difficult for him or her to get better. But it means that deep down in their core they want to improve, they want to feel better. The next assumption, patients may not have caused all their problems but they have to solve them anyway. I like this one in particular. It involves what in DBT we refer to as radical acceptance. It doesn’t say radical acceptance in the assumption but it implies it. 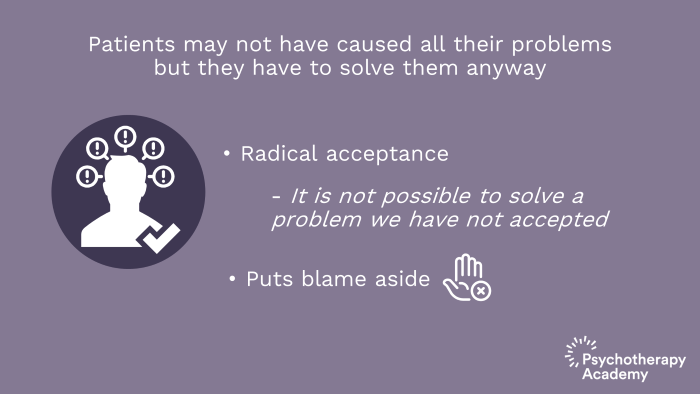 So radical acceptance is when we radically, meaning drastically, fully, 100% embrace reality as it is, not liking it necessarily but accepting it as fact so that then we can solve the problem. So it’s not possible to solve a problem that we have not first accepted. So this assumption, patients may not have caused all their problems but they have to solve them anyway, puts blame aside and acknowledges both that the patient did not cause all of them, that some of them involve no fault of their own, from the environment and that they have to solve the problems that they were given as well as the problems that they made themselves. Our next assumption is patients must learn new behaviors in all relevant contexts, in other words, not just in individual therapy, not just in group skills training. The whole point of intersession contact is generalization of the skills to relevant contexts so that they have coaching in the moment that they’re in. As therapists, I think all therapists have the tendency to back off or to have the urge to back off of a patient, of pressuring a patient to use skills or to make change during difficult times, for example, when that patient is feeling sick, when they’ve had a death in the family, when there’s a breakup or some other life situation arises. However, this assumption brings home the point that these skills that they’re learning and the new behaviors that they’re working on cannot just be emphasized or reinforced in certain contexts. They have to be reinforced in all contexts in order for the patient to fully integrate the skills, in order for them to change their lives. 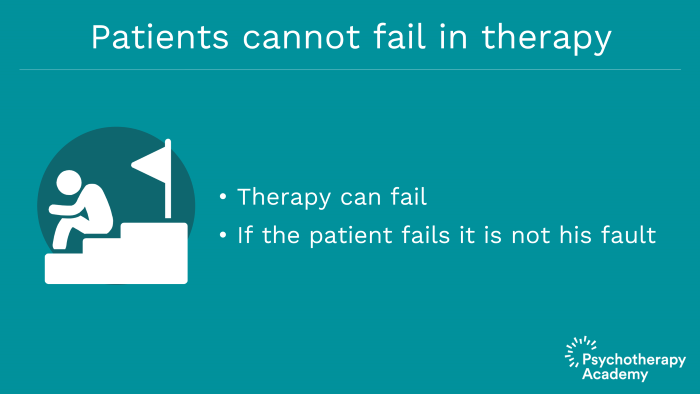 Next, patients cannot fail in therapy. So what this means is – It does not mean that the therapy cannot fail because the therapy certainly can fail. DBT does not work for everyone. It doesn’t mean that the therapist can’t fail because the therapist can fail to apply DBT treatment effectively. What this means is that even if DBT is applied 100% treatment to fidelity and the therapist is doing a fantastic job, if the patient fails, it is not their fault. It means that DBT may not be the treatment for them and perhaps the treatment for them has yet even to be developed. So one of the examples or metaphors that’s used is a diagnosis of cancer. If a patient receives chemotherapy for a cancer diagnosis and the cancer does not go in to remission and in fact worsens, one does not blame the patient. They blame the treatment. The patient did not fail; the treatment failed them. So while this may seem to be a semantic argument, it makes all the difference in the world to the patient who has to be terminated from DBT because it’s not working. Another assumption is that therapists treating borderline individuals and individuals with pervasive emotion dysregulation need support. 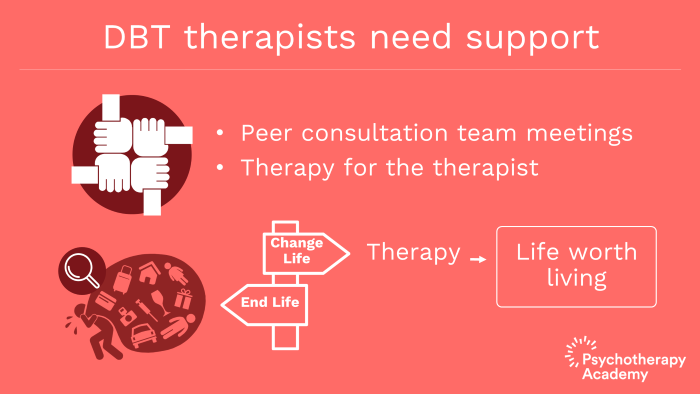 And DBT therapists get this support through peer consultation team meetings. More on peer consultation team meetings in another talk. So one function of team meetings is therapy for the therapist, support for the therapist. And those using DBT cannot do so in isolation. You have to be part of a team if you are a DBT clinician. So finally to circle back, the assumption, the lives of suicidal borderline individuals are unbearable as they’re currently being lived, may sound rather dire but if we look at it through the lens of if a life is unbearable we can either choose to end life or we can choose to change life. So we go in with the assumption as therapists that the lives of these individuals we are treating are unbearable. In fact, Linehan refers to the patients as being in hell. And so one way out from the patient’s perspective oftentimes is suicide, that is to end life. And this assumption implies that rather than ending life we can change life and may help to create that life worth living. Key points. 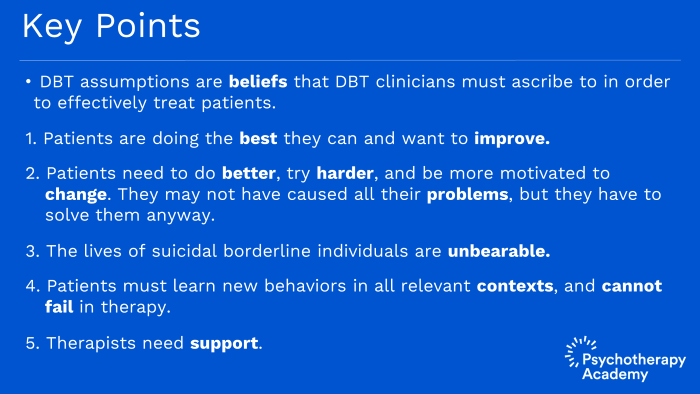 DBT assumptions are beliefs that DBT clinicians must ascribe to in order to effectively treat patients. The DBT assumptions are as follows: 1. Patients are doing the best they can. 2. Patients want to improve. 3. Patients need to do better, try harder and be more motivated to change. 4. Patients may not have caused all their problems but they have to solve them anyway. 5. The lives of suicidal borderline individuals are unbearable as they are currently being lived. 6. 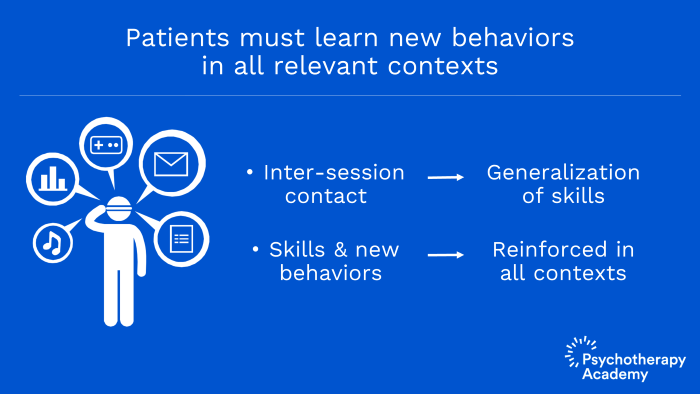 Patients must learn new behaviors in all relevant contexts. 7. Patient cannot fail in therapy. 8. Therapists treating borderline individuals and those with pervasive emotion dysregulation need support.